Happy New Year! I thought I would start the New Year with a review of exciting new discoveries and free from products Ray and I have chanced upon. First up is Caffe Nero www.caffenero.com which has introduced several free from cakes in their high street cafes. Excellent news especially as Costa Coffee www.costa.co.uk seems to have discontinued its range of gluten free brownies and bakewell tarts. 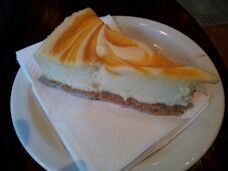 At Caffe Nero, Ray’s favourite is Sicilian Lemon Cheesecake which he describes as “wonderful”. “It’s soft rather than crumbly, your fork slices through it. It’s a very smooth and satisfying cheesecake. I haven’t eaten cheesecake for many years. My favourite used to be Marks & Spencer www.marksandspencer.co.uk New York baked cheesecake when I could eat dairy. This Caffe Nero cheesecake is the closest thing to it. I see there is also a cherry version so I hope to try that one quite soon. Perhaps they might introduce a plain vanilla one with raisins. That would be heaven.” I enjoyed the Caffe Nero wheat free carrot and raisin cake made with rye flour, although there’s also the flourless wheat free chocolate cake. It’s a real treat to be able to go into a coffee shop and order a slice of cake to accompany your hot drink. 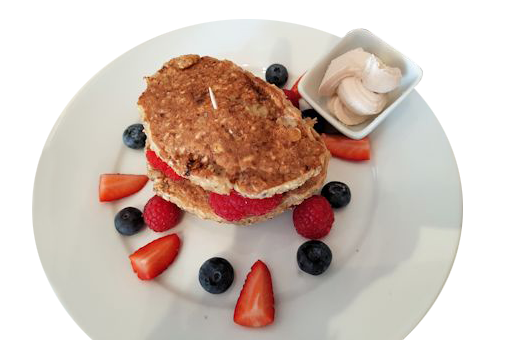 Let’s not forget the independent cafes especially The Healthy Cook Co in Kingston, Surrey www.thehealthycookcompany.co.uk This café offers an array of free from freshly baked cakes and bread. We did enjoy the mince pies (gluten free, dairy free, soya and egg free) as the mincemeat, containing goji berries, mulberries and inca berries tasted fruity and moist. A real treat when compared with supermarket versions which tend to be very sweet and doughy. The pie had thin pastry and a generous filling. 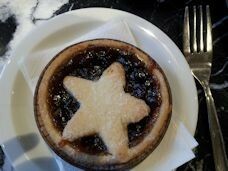 It looked appetising as well with the pastry star decoration and visible filling. Mrs Crimbles www.mrscrimbles.com has often helped me out on journeys as I can buy the gluten free chocolate macaroon on Virgin Trains www.virgintrains.co.uk and on EasyJet flights www.easyjet.com We recently tried the large jam coconut rings which are not only gluten free but also dairy free. Ray said “Normally I avoid desiccated coconut,” he says, “but in this case, the overall taste was good because of the moisture content. 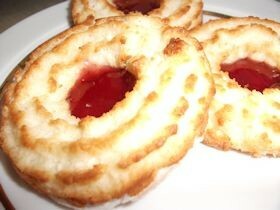 Excellent, to be recommended.” I found them chewy and moorish, the sweetness of the jam combining well with the coconut flavour. 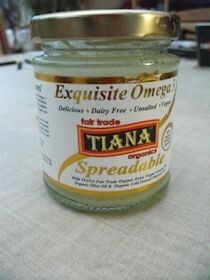 Tiana Organic Exquisite Omega 3 Spreadable www.tiana-coconut.com is a new dairy free vegan alternative to butter. As we hadn’t eaten margarine or butter for many years, it was a treat. I tried it on Genius gluten free bread www.geniusglutenfree.com and the taste reminded me of butter! The added benefits of this product is that it contains Omega 3, 6 and 9. We’ll be using it to liven up dry sandwiches and to enhance cooked vegetables. As a Christmas present, we were given Free From Cherry Shortcake and Free From Fruit Cake Slices, both from Lovemore Free From Foods www.lovemore-freefromfoods.com Although the Cherry Shortcake clearly states they are gluten free, wheat free and milk free, the Fruit Cake Slices only say they are gluten free and wheat free, although we were unable to find any dairy items listed in the ingredients. 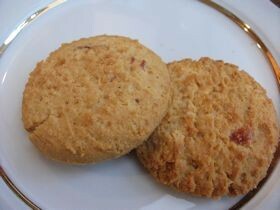 The Cherry Shortcake cookies were chewy, sufficiently moist and slightly crunchy. They have an expensive biscuit taste. The Fruit Cake Slices were very rich and packed with fruit, although we couldn’t detect the glace cherries as shown on the pack. This is an excellent fruit cake, sufficiently moist (unlike other similar products). 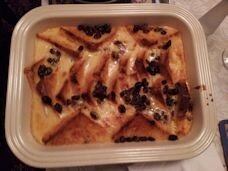 Always on the look out for exciting new free from recipes, our friend Patrick served up a gluten free and dairy free bread and butter pudding which was delicious – neither Ray or I had eaten this dish for many years, so we savoured every mouthful. Patrick adapted the recipe Aunt Libby’s Bread and Butter Pudding from the Genius web site www.geniusglutenfree.com, using soya milk instead of cow’s milk and Alpro soya cream www.alpro.com/uk in place of regular cream.